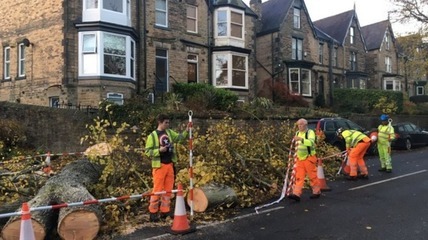 Since Sheffield County Council contracted the private company Amey to maintain the city's streets, approximately 5,500 trees have been felled. Residents have campaigned to protect their trees, and are concerned by the lack of democratic process. Since Sheffield County Council contracted the company Amey to maintain the city's streets, approximately 5,500 trees have been felled as part of the “Streets Ahead” scheme. The £2.2billion 25 year Private Financing Initiative was signed by the council in 2012, giving Amey responsibility over highways maintenance in what is renowned as the greenest city in Europe. 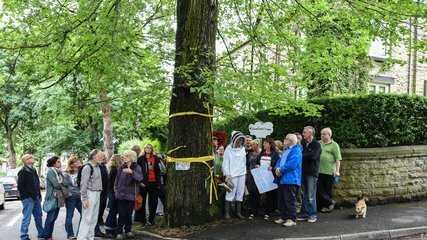 Residents and supporters have campaigned and taken action against the felling of healthy trees, concerned about the loss of health and ecological benefits, the loss of the cultural value of the trees, and the undemocratic, corporate and secretive nature of the felling. Whereas an independent survey in 2006-7 concluded that approximately 10,000 trees required “some form of remedial treatment” and 1,000 were recommended for replacement, there are plans to fell up to 18,000 trees found to be “dangerous, dying, diseased, dead, damaging or discriminatory”. 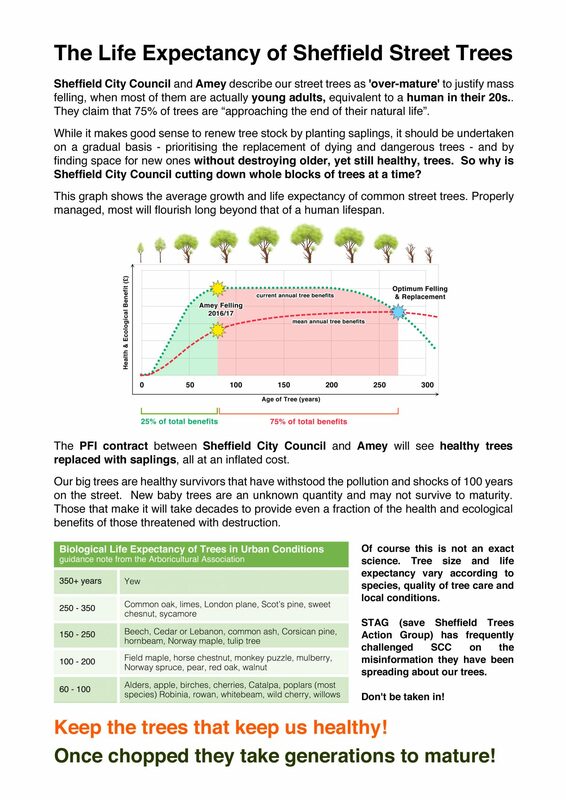 S.T.A.G (Sheffield Tree Action Groups) want the “Discriminatory” category to be removed and the “Damaging” category to be revised to allow some tolerance of root growth and for practical and affordable engineering solutions to be used . Many of the trees being felled are described by Amey as “approaching the end of their natural life”, however campaigners argue many of these Victorian era trees are healthy “young adults” which do not require urgent felling . Mature trees bring greater benefits than the 8-10 year old saplings they are being replaced with, providing more photosynthesis and in turn cleaner air, and more habitats for other species. For example an elm on Chelsea Road which is due to be felled in 2018 is a rare survivor of Dutch Elm Disease and harbours a rare species of white-letter hairstreak butterflies . The Chelsea Road elm and others such as large oaks and cherry avenues are also famous local landmarks, and many were paid for by residents in previous decades. Particularly controversial are the memorial trees threatened with felling which were planted as ‘living memorials’ to local individuals killed in the First World War . In costly  yet insufficient democratic consultation, only 13.4% responded to household surveys , a Tree Forums initiative was suspended, and recommendations given by locals and experts in the Independent Tree Panel were overruled or they were not referred to in time . The Streets Ahead contract, accessible by Freedom of Information, contains many blanked-out sections on the grounds of ‘commercial sensitivity’ ; it thus remains unclear why the engineering options, which would allow both the tree and the roadside to be maintained and which are paid for in the contract, have rarely been used . There has been much local mobilisation in response to the loss of Sheffield’s urban trees. Several neighbourhood groups have formed throughout the city since 2014, and joined to form the umbrella group S.T.A.G. (Sheffield Tree Action Groups) in 2015 . They have organised petitions, campaigns and street demonstrations, as well as a failed attempt at a judicial review of the contract. Members and residents have also attempted to peacefully protect trees from being felled, which has resulted in arrests and court cases. On one occasion on 7th November 2016, residents of Rustlings Road were awoken at 4am by police asking them to move their vehicles to allow for tree felling; two pensioners were among those “arrested in their pyjamas” for resisting in a scene constituency MP and former deputy prime minister Nick Clegg described as “something you’d expect to see in Putin’s Russia rather than a Sheffield suburb” . The Independent Tree Panel released its recommendation to fell only two of the eight threatened trees on Rustlings Road on the same day at 4.25am, although the Council had this recommendation at least a month before ; all the trees were felled. In 2017 the Council gained a High Court injunction to legally prevent tree protectors passing safety zones around trees , which has largely failed to deter motivated residents from continuing their actions . Creative campaigning has included the ‘Great Tree of Sheffield’ competition with celebrity endorsements, a satirical art exhibition, tying yellow ribbons around threatened trees and the Town Hall, a cellist playing a farewell to a tree, festivals and street parties, and a centenary remembrance event for the ‘living memorial’ trees including a drawing competition and an historical reenactment with young men in WW1 uniform ‘standing guard’ of the threatened trees .The conflict has gained media and expert attention both nationally and around the world. Project Details The 'Streets Ahead' Private Finance Initiative is a 25 year contract between Amey Plc, owned by Spain-based Ferrovial, and Sheffield City Council (SCC) which has taken out loans to pay for half of the £2.2 billion contract. Between 6000 and 18,000 trees are to be felled as part of the contract to improve the city's roads and pavements. 1. Installation of thinner profile kerbs. 2. Excavation of footways for physical root examination prior to an ultimate decision being made on removal. 3. Ramping / Re-profiling of footway levels over roots (within acceptable deviation levels). 5. Removal of displaced kerbs leaving a gap in the channel. 6. Filling in of pavement cracks. 9. Root barriers and root guidance panels. 10. Excavation beneath the roots damaging the footway. 12. Creation of larger tree pits around existing trees. 13. Heavy tree crown reduction/pollarding to stunt tree growth. 14. Retain dead, dying, dangerous and diseased trees for their habitat value. Why? Explain briefly. Much information about the basis of decision making by Amey remains undisclosed, and the council continues to support the contract. Trees continue to be felled despite local mobilisation. Living Memorial Trees are due to be felled In WW1 centenary remembrance events, a young man dressed as a soldier "guards" one of the trees planted in memory of a local resident.